One major role of any wireless communication engineer is to make sure that every single computer send and receive information basically known as packet and one way to do this is by assigning IP address to that computer, an IP address can be assign in two ways either automatically using the DHCP protocol or statically by manually inputting all parameters into that computer. read more about how to configure IP here. Now let’s hit the deal of the day subnetting Class C IP address . According timigate.com Statistics have shown that apart from access control list and OSPF, the major area that CCNA students encounter challenges while studying for their certification is IP subnetting. 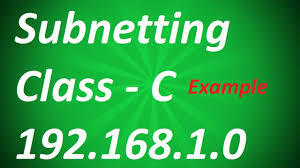 While there are many applications to you help subnet, knowing how to get by manually is very important, after all, you must do it manually to pass the exam. So in this article, I will be sharing how to subnet the class C address with a detailed example. Range of a class C address: if the values in the first octet of an IP address fall between 192 and 223, then it is a class C address. Example, 192.x.x.x to 223.x.x.x. Now, assuming we have 192.168.0.0/24, with this network address and subnet mask, no subnetting is done because /24 which equals 255.255.255.0, is the default subnet mask for class C addresses. Subnetting starts when you have subnet masks from /25 to /30. /31 and /32 cannot be subnetted because they will leave you with no IP addresses for hosts. Step two: determine the number subnets that the subnet mask above will give. Here you use this formula: 2^X, where x is equal to the number of bits borrowed. Since the IP given is a class C IP and the default subnet mask for Class is /24 but we are given /27 in this example, it therefore means we have borrowed 3 bits. Substituting 3 into the formula, we have 2^3=8. This means we well have 8 subnets. 3: How many hosts will the given network address and subnet mask produce per subnet? To answer this question, you will use this formula; 2^y-2, where y equals the number of bits off. If in the question we were given /27 out of a total of 32 (IP version 4 is a 32-bit address), it means we have 32-27=5. We have 5 bits off. This gives us 2^5-2. This will be 32-2 which gives us 30. (The 2 we subtracted is for the broadcast and network addresses. You cannot assign those addresses to hosts on your network). From here we know that we will have 30 valid hosts for each of the 8 subnets we will get from 192.168.0.0/27. Next is to determine the range of these subnets as well as the valid IPs in each subnet. Please stay connected as : subnetting class B, network address is coming your way soon. That is all you need to answer any question regarding class C subnetting. ← Common Computer Security Issues and Solutions Part2. I remember when I was young and tried to learn all of this there was no internet. I wish at this time we would have had resources like this. Class C subnetting is until today the most common one in any LAN.